HomeAcrylic plastic—How is it made? Acrylic plastic—How is it made? Polymethyl methacrylate is a plastic containing one or more derivatives of acrylic acid. We know it simply as acrylic. It is sold under many trade names: Plexiglas, Lucite, Acrylite, Perspex, Acrilex and Crystallite. There are two types of acrylic sheet commonly used by the sign industry—cast and extruded. Cast acrylic is made by injecting the ingredients into molds as a molten liquid, about the consistency of syrup, in one of two ways. The “cell cast” or “batch cell” method is made in sheets in a mold made of two plates of polished glass with gaskets at the edges. The liquid plastic fills the cavity between the two plates of glass and may be heated. Several plates may be stacked to produce multiple sheets of acrylic. After curing, the molds are disassembled and cleaned for reuse. “Continuous cast,” is a higher production method. The molten mixture is cast between two continuous sheets of polished metal in much longer runs as it goes through a series of heaters for curing. Again, gaskets seal the edges. Cast acrylic is polished and is known for optical clarity. It is harder than extruded acrylic and less prone to scratch. It is also more heat resistant, which is why cast acrylic cuts so much cleaner when machined, whereas extruded acrylic tends to melt behind a saw blade. 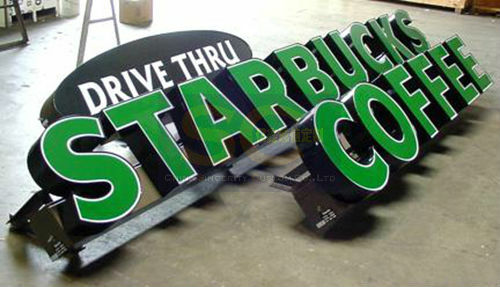 Extruded acrylic is a less costly process and provides the larger share of acrylics used in the sign industry. It is manufactured by forcing the semi-molten acrylic mixture through forms and rollers. Acrylite FF is an example of an extruded acrylic sheet. Acrylite GP is cast. Airplane and helicopter canopies are made from cast acrylic because of its optical clarity. Plastic sign faces are mostly extruded acrylics. ← Are your ADA-compliant signs really ADA-compliant?